The properties of electricity have fascinated scientists and lay people for hundreds of years. For early scientists its mysterious, quasi-magical properties were not well understood but its manifestations as static electricity or lightning was experienced by everyone. Early medical experiments discovered that the limbs of dead animals could be made to twitch when an electrical charge was sent through them. There were reports of apparently dead or drowned individuals being revived with a jolt of electrical current. 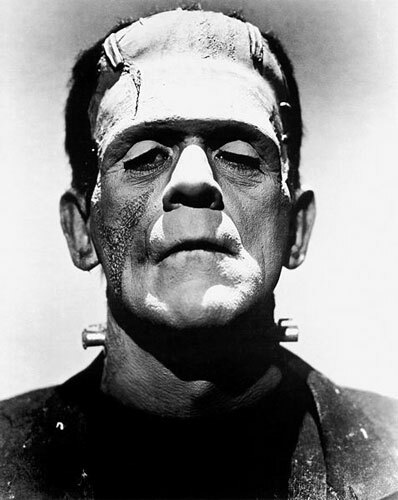 Perhaps the most famous use of electricity was in the novel Frankenstein (1819) by Mary Shelley on just this premise of revitalizing the dead. Needless to say electricity held the public’s fascination more so than almost any other technology. So when electricity started to become a viable alternative to gas lighting it was received with both a sense of trepidation and wonder. The study of electricity had been taking place since the 17th C. but it wasn’t until the beginning of the 19th C. that scientists started to really understand its basic properties. In 1800 Alessandro Volta developed his voltaic pile, the first battery made from alternating layers of zinc and copper. 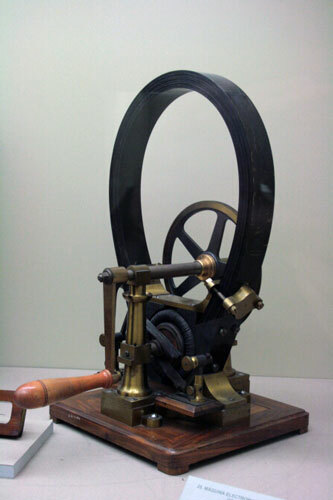 With this device he created the first sustained, continuous flow of electricity. Interest in electric lighting started to parallel the development of electricity almost immediately. In 1809, Sir Humphry Davy with the aid of a large voltaic pile produced the first lasting electric arc – the voltaic arc. He passed a current through a charcoal stick, touched another charcoal stick where a spark passed from the first to the second stick. He then separated the sticks enough so that a brilliant continuous spark leapt between the charcoal sticks. The charcoal sticks also heated up causing them to incandesce creating additional light. Unfortunately the charcoal sticks deteriorated rather quickly and the dc power that the batteries produced was unsustainable. Unfortunately, significant advancements in the generation, storage, and transmission of electricity had to be made before any real progress could be made. It wasn’t until after 1821 and 1831when Michael Faraday made his important discoveries in electromagnetism and induction that led to the development of electric motors and dynamos. One of the other most important advancements was made by the Belgian Zeobe Gramme who developed a variety of electrical dynamos that ranged from small hand-crank dynamos all the way up to a large steam driven dynamo that was capable of producing large quantities of ac power. Another important development was made by the Russian Paul Jablochkoff who improved the arc lamp by placing the charcoal conductors inside a glass globe and regulated how the carbons would burn. When he married his arc lamp technology with Gramme’s large dynamos he was able for the first time to develop the first integrated system of electrical production and illumination. 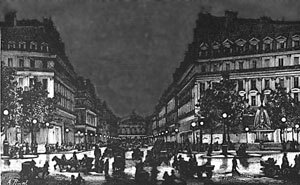 He got the opportunity to demonstrate his ideas at the Paris Exposition of 1878. He was able to install 64 arc streetlights along a half-mile stretch around the Place de l’Opera. Since the arc lamps were much brighter than the existing gas street lights they were able to be placed approximately 150 feet apart. Each one replaced up to six gas streetlamps. Arc streetlights were not without their detractors. The output ranged from 500 to 3,000 candlepower which was significantly greater than gas lighting. Without proper shielding the lamps produced copious amounts of glare and the quality of light was more objectionable than gas lighting. 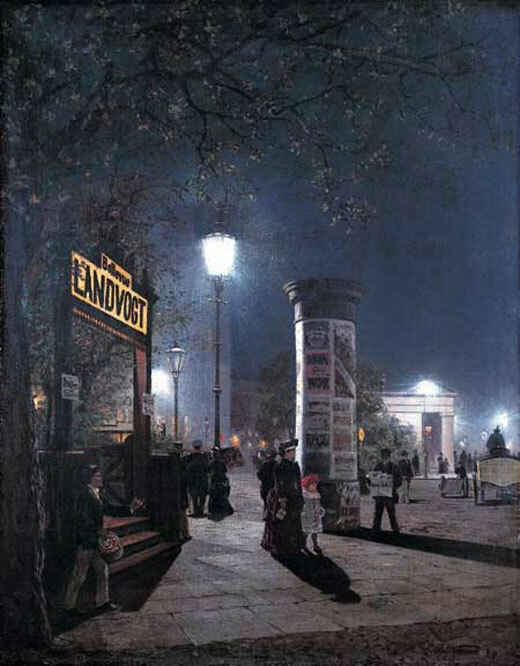 As a result the street lamps had to be installed at much higher than above normal sightlines than gas lamps. This spread the light out over much larger area and profoundly changed the scale to which people related to the distribution of light. No longer was there the intimacy of pools of light close to street level where people would walk. Instead, the light was distributed over large areas and spread widely over the street and high up onto the sides of buildings where it was unwanted.